The latest Windows 10 Creators Update build brings many new features to the table, adapting the OS features to its users’ needs. Build 15002 adds Lunar Calendar support for the Taskbar, allowing you to quickly check the lunar date alongside the current Gregorian date. This is a very useful feature because it eliminates the need to launch a browser and search for the equivalent lunar date. Of course, there are many Lunar Calendar apps that you can install on your computer. The new Windows 10 Lunar Calendar support now saves you the hustle and bustle of resorting to third-party apps to find the Lunar Calendar information that you’re looking for. 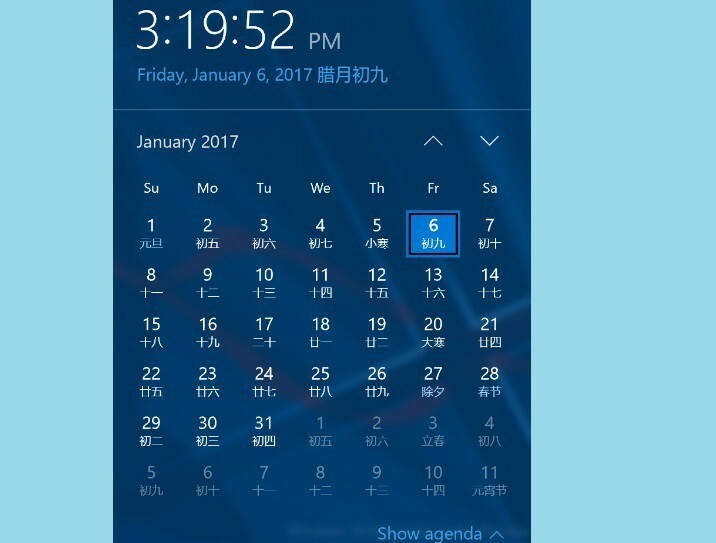 The new Windows 10 Lunar Calendar highlights special holidays with different colors. To enable Lunar Calendar support on Windows 10’s Taskbar, follow these steps: go to Settings > Time & Language > Date & Time > pick which additional calendar you want to see. Those of you who follow the Simplified or Traditional Chinese lunar calendar can now use the taskbar calendar to quickly check the lunar date alongside the current Gregorian date. Special holidays are called out in accent-colored text. […]Thanks to everyone who sent in feedback requesting this! The lunar calendar is based on cycles of the lunar phases, contrary to its more popular counter-part, the Gregorian calendar, which is a solar calendar based on Earth’s revolution around the sun. The lunar and solar calendars differ as to which day is the first day of the month. In the Chinese calendar, the first day of a month is the day when a new moon occurs in a particular time zone. Meanwhile, until Microsoft rolls out Lunar Calendar support to all Windows 10 users, you can use this Chinese Calendar app or check out our past mention of this Moon Phase app for Windows 10 users.